Mobile web browsers ගත්තොත් මේ වෙනකොට වැඩියෙන්ම ජනප්‍රිය web browser එක වෙන්නේ Google Chrome. වැඩියෙන්ම ජනප්‍රිය එක Chrome වුණාට, ඒකෙන් කියවෙන්නෙ නෑ අනිත් browsers ජනප්‍රිය නෑ කියලා. Samsung Internet, Microsoft Edge, Mozilla Firefox වගේ තවත් ගොඩක් ජනප්‍රිය web browsers ගොඩක් තියනවා. මේ අනෙකුත් web browsers වල ජනප්‍රිය බව වැඩි කරන්න එයාලා හැම වෙලාවෙම try කරන්නේ හැමෝටම වඩා වැඩියෙන් tracking protection, add-ons වගේ වෙන වෙන additional features ලබා දෙන්නයි. Opera කියන්නෙත් Android වලට තියන ඒ වගේ 3rd party web browser එකක්. ඔයා ගොඩ කාලෙක ඉදන් mobile phone එකෙන් internet use කරන කෙනෙක් නම් Opera කියන නම ඇහුනු ගමන්ම ඔයාගේ මතකයට එන්නේ Opera Mini කියන web browser එක. මතක ඇතිනේ Android ජනප්‍රිය වෙන්න කලින් තිබුනු Symbian, Java based Operating systems වල රජ කලේ Opera Mini web browser එක කියලා. ඒ වුණත් Opera Mobile කියන web browser එක ටික කාලයක් ගිහින් නවත්තලා, ඒ වෙනුවට Opera නමින්ම Chromium-based web browser එකක් release කලා. ඔන්න ආයෙත් වතාවක් Opera ඇවිල්ලා තියනවා අළුත්ම web browser එකක් එක්ක, ඒ තමයි Opera Touch. මේක විශේෂයෙන්ම හදලා තියෙන්නේ ක්ෂණිකව එහෙමත් නැත්නම් පහසුවෙන්ම අපිට ඕන දෙයක් search කරගන්නයි. ඒක type කරලා,QR code එකක් scan කරලා, Barcode එකක් scan කරලා, එහෙමත් නැත්නම් voice search බාවිතයෙන් වුණත් search කරන්න පුළුවන්. මේ browser එක හදලා තියෙන්නේම එක අතකින් බාවිතා කරන්න ලේසි වෙන්නයි. ඒ වෙනුවෙන් එයාලා හඳුන්වලා දීලා තියනවා Fast Action button කියලා browser එකේ දිගටම පේන්න තියන button එකක්. ඒ button එක tap කලාම අපිට පුළුවන් Instant search කරන්න ඒ වගේම hold කලාම most recent tabs ටික බලන්නත්, reload කරන්නත්, close කරන්නත් වගේම ඒ tab එක computer එකට යවන්නත් ඒකෙන් පුළුවන්. 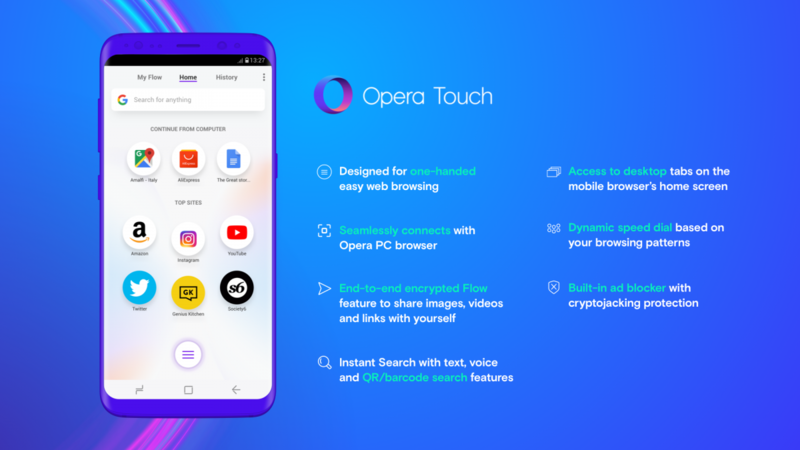 Opera Flow කියන්නේ Opera Touch එක්ක එන තවත් feature එකක්. මේ පහසුකමෙන් අපිට අවස්ථාව ලැබෙනවා Opera desktop browser එකත් එක්ක mobile browser එක connect කරන්න, එහෙමත් නැත්තම් multiple devices අතර අපේ browsing experience එක sync කරගන්න. මේ දේ වෙනුවෙන් අනිත් හැම browser එකක්ම කරන්නේ username සහ password බාවිතා කරගෙන sync කරන එක. 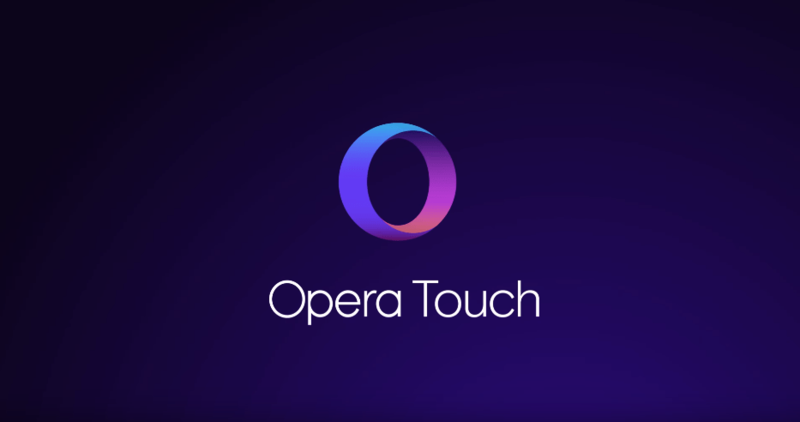 නමුත් Opera Touch එකේ මේක user ට ගොඩාක් ලේසි කරලා තියනවා. අපිට කරන්න තියෙන්නේ Web browser එකේ පෙන්නන QR Code එක mobile browser එකෙන් scan කරන්න විතරයි. මේ පහසුකම හරහා Links, videos වගේම Notes වුණත් එක click එකකින් හැම device එකටම send කරන්න user ට අවස්ථාව ලැබෙනවා. මේ Opera Flow පහසුකම ඔස්සේ අපේ වැදගත් data එහේ මෙහේ යන නිසා, මේ connection එක end-to-end encrypt කරන්නත් Opera කටයුතු යොදලා තියනවා. ඒ වගේම මේ දවස් වල වැඩිපුර කතාබහට ලක් වෙන Cryptojacking එහෙමත් නැත්තම්, Crypto currency mining වලට user ගේ processing power එක හොර රහසේ බාවිතා කිරීමට ඇති risk එකත් අවම කිරීමට Opera Touch සමත් වෙලා තියනවා. මේ cryptojacking නිසා web browse කරද්දී ඔයාගේ phone එක රත්වෙන්න වගේම battery එක ඉක්මනින් බැහැලා යන්නත් පුළුවන්. Opera Touch එක්ක built-in ම ad-blocker එකක් එනවා. 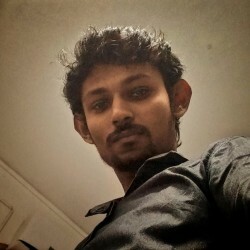 ඒක මුලින්ම disable වෙලයි තියෙන්නේ. නමුත් user ට පුළුවන් ඒක enable කරලා ads වලට යන power එක, bandwidth එක save කරගන්නත් වගේම web browsing speed එක වැඩි කරගන්නත්. ඔයාලටත් පුළුවන් Opera Touch එක install කරගන්න පහල තියන link එකෙන්.